A controversial film about the life and assassination of human rights worker Rajani Thiranagama from northern Sri Lanka is being screened in London as a part of the Human Rights Watch film festival. 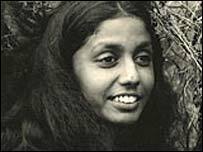 Rajani was assassinated at the age of 35 in the northern town of Jaffna in broad daylight in 1989, after she published a book about human rights abuses in the north of war-torn Sri Lanka. No More Tears Sister, screened from 22 March, follows her life and work as narrated by her sisters, husband and two surviving daughters. Rajani, a university professor, was one of the founding members of a group called Jaffna University Teachers for Human Rights. The group chronicled rights abuses committed by all sides involved in the civil war. Her life and death marked a turning point in the Tamil separatist struggle. The killing is one of the early assassinations attributed to the Tamil Tigers who have never denied killing her. The film is directed by Canadian film maker Helene Klodowsky and produced by the National Film Board of Canada. Michael Ondaatje's sensitive narration, and the highly effective use of archive footage and interviews, add value to a film which is powerful and poetic. 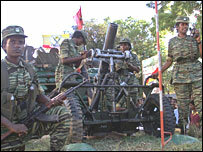 The film portrays a liberation struggle evolving against a background of oppressive politics in independent Sri Lanka. The lives of the sisters mirror those of many of their contemporaries. They sympathise with and are seduced by the romanticism of the Tamil political struggle, which quickly turns into a fully-fledged armed insurrection against the state. While older Nirmala pursues the ideals of a socialist revolution, Rajani physically involves herself in the fight against government forces. The film documents the pressure put on the personal relationship of two committed activists who sacrifice their lives for a cause they believe in. Interviews with Rajani's husband tell a story of a family torn apart by a conflict that destroyed a whole community. He narrates it with remarkable honesty and emotion. While the husband - a Sinhala socialist involved in a clandestine armed uprising against the state - rejects the ideals of the Tamil armed insurrection, the elder sister joins the struggle without any hesitation. Rajani's involvement begins as a campaign to get her sister released from prison and torture. Nirmala, a left-wing activist from her student days, belongs to a group demanding a political ideology for the Tamil struggle, rather than a purely nationalist one seeking a separate state. The two women become disenchanted when they find leaders of the Tamil movement as intolerant of dissent as the Sri Lankan government. Rajani then devotes herself to the people of the north who are victims of the war. Her loyalty and devotion to the people bring her into conflict with the rebels, as well as with government security forces and the Indian army. The book (The Broken Palmyrah) she writes along with her colleagues upsets both the government and the rebels. No More Tears Sister is about a sister, wife, mother and uncompromising activist, who was radical and controversial. In a series of revealing letters, we learn about Rajani's dedication to her work and family. She writes about love and her personal quest for it. In one letter she talks about her imminent death. She said it would come from the very people who are near to her. The film is not only about her life but also about the trauma suffered by innocent people close to her. Her daughters and her family become the real victims. The film empathises with many thousands of families around the world who have suffered similar experiences. It manages to be extremely personal and sensitive and yet be universal at the same time. Rajani's death is portrayed not as that of an individual but of a whole community and a threat against its consciousness. Archbishop Desmond Tutu has praised Rajani's commitment to peace and justice as "an inspiration to all involved in the struggle for human rights". 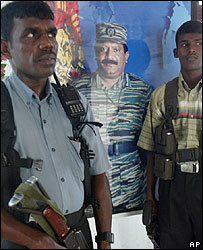 Even today, many Tamils in Sri Lanka do not know if Rajani is to be considered a hero or a traitor. She comes over in the film as a woman who did what she had to do at the time with instinct and dignity - a product of her times and the circumstances she lived in. No More Tears Sister is about the world that betrayed her conscience and that of others like her.